When you want to print certain rows/columns of data in a worksheet, you will most likely hide the other rows/columns, however when you want to unhide cells in hidden rows/columns it can be hard to locate them. 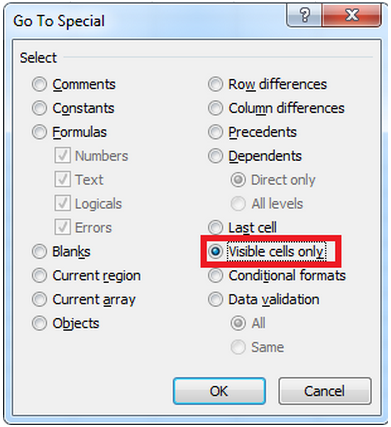 By selecting all visible cells in the worksheet, you can easily detect the hidden rows/columns, as they will be highlighted in white and thus can be easily located. Rows 4, 5, 12 and 13 are hidden in the sample worksheet shown below. a) On the Home tab, in the Editing group, select Find & Select. 2. 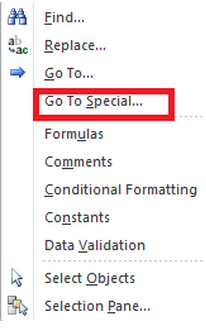 Select Go To Special. 3. Under Select, click Visible cells only, and then click OK.